You may have heard the acronym HRV, but do you know what it is and does? Read on for a quick course in how they work, then Call R&B to get all your questions answered. The idea behind a HeatRecovery Ventilation system is to bring fresh air into a home without causing excessive demand on the heating system even if it’s cold outside. If you look at the picture above, you’ll see that the basis of the HRV system is a heat exchanger or heat recovery unit. As the incoming cool fresh air is moved through the unit, it is heated by exhaust air that is already hot. The exhaust air has been drawn out of circulation in the rooms via the existing cold air return vent and ducting. It is designed to allow the heat to transfer without mixing of air sources. The now warm, fresh air is then connected to the heating system and circulated throughout the house. Once the exhaust air has done its job it is vented from the house. You may have also heard of HEPA filters, a type of mechanical air filter that forces air through mesh that removes and traps particles in the air like many allergens and tobacco smoke. However, like anything their strengths come with considerations like restriction of airflow. The model of HRV that we recommend and install uses a Turbulent Flow Principle, their HEPA filters claim to operate without slowing down the air flow. R&B Plumbing has extensive experience in this type of ventilation as Vancouver has an ideal climate for it. 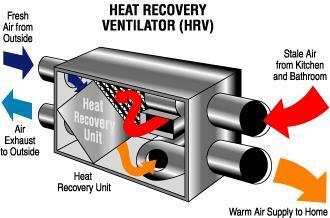 An HRV system is an excellent and very cost effective addition to any home. It’s also a very natural way to improve air quality. Want to know if this type of system is right for you? Call R&B today, or learn more about air quality HERE. Thank-you, we are super happy with our new pipes!